Gula Semut: Get Me Ant Sugar, please! How if I tell you that you can drink ants? Euy….luckily that is only IF. While I was in Pohuwato, one of the regencies in Gorontalo, I visited one place where I could see the making process of ant sugar. Obviously, it wasn’t made from tons of blended ants. I called it ant sugar, literally, because it is so if I do a direct translation from the local language, Gula Semut. ‘Gula’ means sugar and ‘semut’ means ant. I didn’t trick you, right? But I won’t be surprised if at first, you thought that the ant sugar main ingredients are ants. Seriously, I won’t be surprised. When I heard about it before seeing the actual thing, I did have the same thought, too. Ehmm..ehm..And I was glad that I was so wrong and it didn’t happen that way. Otherwise, the ant will already be listed as one of the endangered species on this beautiful earth. If you have been wondering what is this Regency famous for? Besides the fishing village of Bajo Tribe in Torosiaje, which is actually just getting started to be more popular recently, probably finding out how Gula Semut is produced in Pohuwato will be an interesting activity to do. At least for me, I learned something during the visitation. Gula Semut is a sugar made from palm nectar or also called Neera that has gone through several processes before it is ready in a form that convenience for us to consume. Neera itself tastes sweet, translucent in color, and high in nutritional value. From Neera, it will be processed until it becomes a final product such as Gula Batok, a solid bar of palm sugar and Gula Semut. 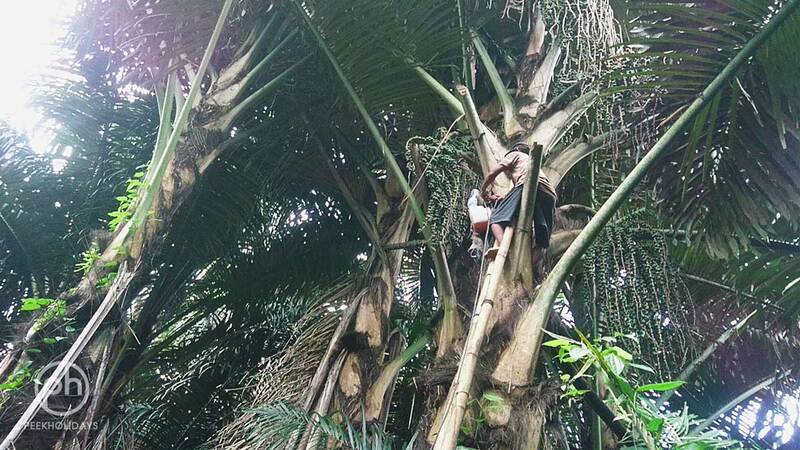 Every morning and usually before sunrise, the palm tappers (the people who collect the Neera) will climb up the trees to collect the containers full of Neera. Basically, they cut the stem of the palm tree and let the Neera slowly drips into the container. They can collect about 35 liters Neera every day but even so, after the process, the amount will shrink significantly and only left very little of it. They used to use bamboos to collect Neera, but for the hygiene reason, now they use plastic containers instead. The Neera collected will then be poured in a big wok and let it boiled until it is thickened. During this process, the half-boiled Neera is also called Soba, which we can drink right away. The taste is definitely sweet and it actually tastes even better while it is still piping hot. Once it is thickened, the Neera will be placed into a half cut coconut shell. The coconut shell works as the mold for Gula Batok and it will be left there until it turns solid hard. The hardened Neera or now is called Gula Batok will be packed and sold to the market. As we know, Gula Batok is often used for cooking dishes in Indonesia. Meanwhile, for Gula Semut, the process is longer. After it is hardened, there is one more step to go. The Gula Batok will be smashed repetitively until it turns into powder or softer form. This is why we call it Ant Sugar or Gula Semut. At a glance, this sugar does look like a group of ants especially the color that is dark red and brownish after the processes, resembling the red ants. Gula Semut produced in Pohuwato is all using natural ingredients. To prolonged the storage of Neera, they will put pieces or slices of woods from Bohuyu tree that will not only helps to preserve but also gives slight red color to that originally translucent Neera liquid. For the production process, they still use the manual method. Meaning, from collecting Neera, boiling it, till it becomes a ready product such as solid palm sugar or Gula Semut that we have been mentioning since the beginning, all are done manually by hand. The Gula Batok and Gula Semut making process may look easy. Plus, there is no heavy equipment needed to produce the sugars. However, if we don’t have the patient, that will be the end of the story. Because to wait for the container to be filled with a reasonable amount of Neera, it takes times and maybe days. Not yet the boiling and smashing process for Gula Semut. From the prices, we shall know that it is not an easy task. In here, in Pohuwato, the selling price for Gula Batok is at IDR 10.000,- per kg while for the Gula Semut is at IDR 100.000,- per kg. Yeap, Gula Semut is way more expensive than Gula Batok. I believe the price speaks the efforts put into producing each type of sugar. Until here, now you should know that Gula Semut we have been talking about is actually the brown sugar that we commonly use for our coffee or tea or cooking for some people who prefer. So, the next time you hear people mentions about ant sugar or Gula Semut when you are in Indonesia, you should already know that they are not talking about sugar made from blended ants. Have you seen any brown sugar making process before? Do you prefer brown sugar or white sugar in your coffee or tea? I am definitely in the brown sugar group! Graphic Designer. But by heart, I know I am more than that. I love art and nature as well as enjoy traveling and meeting people.